Alan? Oh! It's actually a pretty common name here where I'm from. I just managed to like it and name him as so. By the way, I also gave it a try with 3 of PhatCat's stallions. The results were, not as wished, but certainley mind-blowing. Here he is; from PhatCat's (s)(xmm) Double Misty Fire Stallion: He has Sapphire slightly bright Misty eyes and a Sapphire pastel Misty mane. His coat is plain Blue light pastel. And Here is the other misty foal, courtesy of Dodec's (No Named) Fire stallion; He has a Vermillion Misty Coat,a Red slightly deep Mane and Vermillion Eyes. Double misty already? Yooo,you're so lucky :D Congrats! So can someone explain to me exactly what it means to have a color that is pure or misty and how to obtain that in a pony? Do I need to breed a certain way or have a certain pony to breed for this to occur? Usually a pony's colors are shown in square swatches. A pure color is shown in a diamond shaped swatch and a misty color is shown in a round swatch. 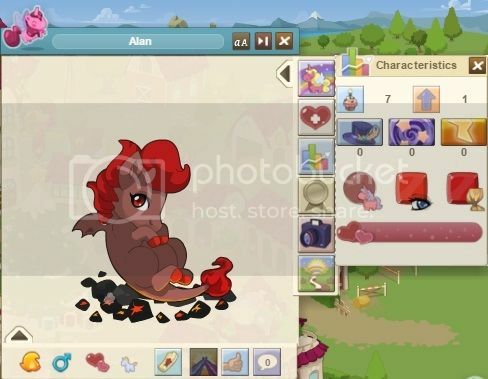 A pure color can be obtained by breeding two ponies with the exact same color in the same place; body, coat, or eyes. A misty color can be obtained by breeding a pony of any color with a grey pony. The odds of getting a pure or misty are low, so you'll probably have to try several times before you get one. 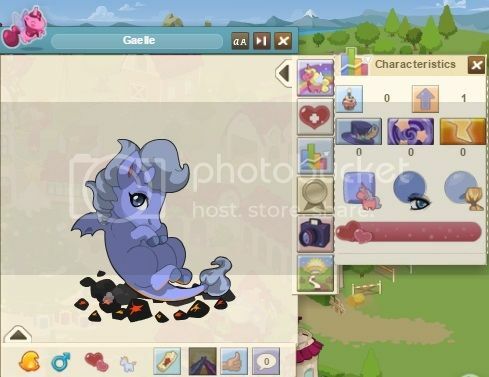 The reason is that Feerik wanted to have pure and misty ponies to be "special" since it was too easy to breed pures and negatives (now misties) in V1 of the game. It was a very bad decision the company made, but anyway, it *is* possible to breed a pure or misty pony when you have tons of patience. I succeded in triple-misty twice so far while triple-pure never happened in six years of breeding. If anyone is *still* looking for mistys or pures, I have a few. Also have negatives from V1 (I think, possibly older) that I never changed over to the new colors.